Interview with Professor Dr iur. et phil. 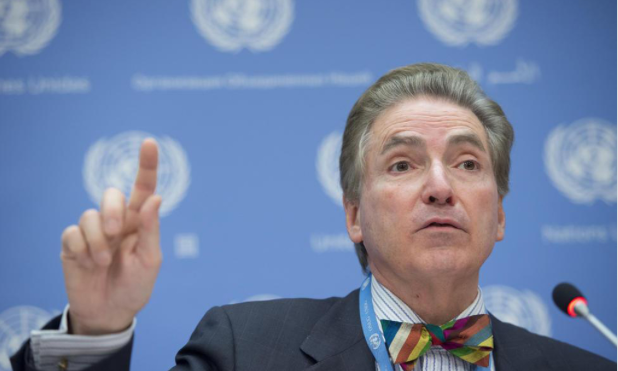 Alfred M. de Zayas, UN Independent Expert on the Promotion of a Democratic and Equitable International Order. From 26 November to 4 December 2017, Professor Dr Alfred M. de Zayas carried out an official mission in Venezuela. He had requested an invitation in August, which the Venezuelan Government granted in September, making him the first UN rapporteur since 1996 to be invited and to conduct an official UN visit to Venezuela. The purpose of the mission was to explore how the Bolivarian Revolution had implemented human rights – especially in the economic, social and cultural domain. It was his special concern to compare the coverage in the mainstream media of the United States and Europe with the Venezuelan reality on the ground. In order to get a sufficiently objective picture, the UN expert met with representatives and activists of 35 non-governmental organizations specializing on human rights issues, with representatives of industry and commerce, members of the opposition National Assembly, with Church officials, with victims of violent demonstrations and wioth relatives of detainees. Apart from meetings with a large number of government ministers, he met twice with Foreign Minister Jorge Arreaza and his staff. During his stay he could move freely, as has already been reported in “Zeitgeschehen im Fokus” (n. 18, 23/12/2017). He also gave a lecture at the University of Caracas. In the following interview, the UN expert reports about his impressions and experience in Venezuela. Professor Alfred de Zayas The Bolivarian Revolution, which has taken place in Venezuela, developed a model that worked rather well in the first 10 years. That was partly due to the high oil price. Venezuela depends on oil revenues by 95 %. With these revenues, the state could finance many social projects. But now that the oil price has dropped by more than the half, the country faces massive disruptions in the acquisition and distribution of food, medicines and other products. What distinguishes the model in Venezuela? It is a social model that wants to achieve a fairer distribution of the country’s wealth. Meanwhile, 2 million homes have been handed over to the poorer part of the population. Thus at least 8 million persons have benefitted from affordable apartments. There is also the so-called system of CLAP (Comité Local de Abastecimiento y Producción – Local Committee for supply and production), in which the government distributes food parcels to the poor. Those who cannot pay for the packages, receive them for free, of course. What does such a parcel contain? I did open one when I was visiting one of the modern and very clean “Urbanizaciones” (government housing for the poor). There are 16 kg of food in it: sugar, rice, cooking oil, flour, cornmeal, milk powder, etc. A family gets such a parcel twice a month. Therefore, there is no “famine” in Venezuela, despite media reports and generalizations. There is, however, a shortage in several sectors, and some products are hard to get, but the population does not suffer from hunger as for example in many countries of Africa and Asia – or even in the favelas of São Paolo and other urban areas in Brazil and other Latin American countries. There are mainly problems in the timely distribution of imported products – but this is predominantly the responsibility of the private sector, which often enough deliberately boycotts the distribution, sometimes stocks products in large warehouses and then takes them to the black market instead of delivering them to supermarkets — just to make a higher profit. What is special about the “Bolivarian Revolution”? It is an alternative model to capitalism, to unregulated free market economics. It is not “Marxism”, and certainly not “Marxism-Leninism”. It is an attempt to give the capitalist system a humane face. Since 1999, when Hugo Chávez came to power, a certain reorientation of the country took place, which could set a precedent for Latin America and many developing economies. There are major achievements, which the mainstream media systematically ignores – e.g. illiteracy was eliminated within shortest time (as was the case in Castro’s Cuba). School education is free, from kindergarten to university. There is a system of free medical care, a system of support for young mothers, a major effort at building affordable housing and expanding the public transport system. … I warn against this technical term, because a “humanitarian crisis” can be easily exploited to justify a so-called “humanitarian intervention” or to aim at a “regime change”, under the pretext that the government lets the population starve. Some states pretend that the Venezuelan government can no longer guarantee the rights of the people. Hence, a humanitarian crisis emerged and now they want to intervene militarily to “save” the Venezuelan people from a failed socialist experiment. What is the situation on the ground? I stayed in Venezuela for 8 days of intensive meetings back-to-back; I could move around freely wherever I wanted. I did not see any street children and I also did not see any person begging. I have not seen a single beggar in Caracas although I walked and drove across the entire city. I also walked by the poorer quarters, where I did see queues of people waiting for some subsidized or rationed products. The situation has many facets, and I do not claim that there is no hunger and no scarcity of medicine. I simply say that the existing cases of children dying of malnutrition or lack or medicine do not add up to a “humanitarian crisis”. I did not see any violence, although the press keeps telling us about it. As a UN official I have been in many places where you “smell” violence, where you sense tension in the air and feel that you yourself may be in danger. That is not the case in Venezuela. There are homicides – many of them associated with drugs and international crime. Honduras is much worse. People who beg are the order of the day in our western industrial nations. No-one would think of talking about a humanitarian crisis, for example in Germany, because there are beggars in the streets. In Venezuela, I did not see beggars. No doubt, there is poverty, but the population is not depressed – certainly not in the same degree as the people of East Germany in the 70s, where people were dispirited and demotivated and went about with pale faces, sad and depressed. The population in the streets of Caracas is Latino in the best sense of the term, they make the best of things and do not let scarcity and boycotts turn them into zombies. Just like in any other city; everywhere there are cars, motorcycles and bicycles on the road. Can the people supply themselves with food? There are enough fruits and locally-grown vegetables. People eat bananas or mangoes in the streets. There is a certain lack of the products that the domestic and foreign monopolies determine. What is the situation like in the supermarkets? I have seen several food stores and markets – and I took photos of them. It is not true that the food stores are empty. Of course, some have empty shelves – I got such pictures from non-governmental organizations (NGOS) – but there was always enough of everything. Of course, there are some products that are imported because Venezuela cannot manufacture them itself. They are scarce commodity. But you can live very well without these products. The fact that the supply of hygienic items for women or diapers for the babies are scarce is a direct result of the failure of the private sector to import these goods and to distribute them to the supermarkets. However, you can get everything on the black market – but at exorbitant prices. Is a specific shortage created there to stir up the people’s dissatisfaction with the government? There are studies and statistical data from several university professors who investigated this phenomenon – especially why and how supply shortfalls are getting worse, especially when elections or referendums are imminent. They are supposed to affect people negatively, so that they vote against the government. This is called “voto castigo” (penalty vote) in Spanish. If you read an article from the New York Times, it will say that there are bottlenecks in supply in Venezuela, for example also for medicines. However, you will not read anywhere why this is so. You will not read anywhere that the private sector does have the foreign exchange to import the necessary medicines. This is not said. It is not also said that a huge smuggling has emerged for subsidized products – subsidized Venezuelan rice or flour can be bought in Bogotá. What are the reasons for these phenomena? There are a number of reasons, which I was able to observe during my stay. I have to study them in more detail. I was given an extended documentation from various sources that I still have to digest. There are also very good books about this topic. An economist in Caracas, Professor Dr Pasqualina Curcio, carefully explained in her book how the economic war against Venezuela caused this situation of shortage, and that was no accident – it was deliberate, absolutely targeted. In the period around the elections – approximately two or three months earlier – the goods suddenly disappear. Especially hygiene items cannot be purchased any longer. However, warehouses were discovered, and that is also documented, that were full of these products. I was also given a pictured documentation on the matter. Do you mean that shortages are artificially generated? Yes, the goods are often not delivered to the supermarkets but traded on the black market at exorbitant prices. There are, of course, institutional problems and multiple inefficiencies in the socialistic model, about which I made concrete recommendations to the government. Yet another problem, which I discussed with several ministers, is the unnecessary price controls and artificial exchange rates – this all results in corruption and abuse. The government should instead give the most vulnerable persons direct financial support, rather than making use of a price control. The danger of price controls, as we know from the Soviet Union, is that parallel markets emerge and with them large-scale corruption. People are people, and if they can buy subsidized goods, the temptation to resell these subsidized goods at a higher price is too big. You can make a killing with subsidized corn flour, with subsidized rice, which you can then smuggle into Colombia, Brazil, Aruba and sell it there at great profit. Venezuela has a very long border with Colombia and Brazil. The Caribbean Islands are easily accessible, too. There is an internationally organized mafia that operates the process, but apparently the governments of the neighbouring countries do nothing to stop this smuggling. If a store in Bogotá offers cheap rice from Venezuela, we should assume that the traders know where the rice comes from: It is either stolen or smuggled. In any case it was brought into the country illegally. The government does nothing – or too little – against these supermarkets. Moreover, Colombia allows the Venezuelan currency to be changed at wildly fluctuating rates of exchange. This has devastating effects on the economy and financial situation in Venezuela. What about agricultural production in the country? Diversified agricultural production is now being systematically promoted, but this is a process that takes time and requires importing seeds and other goods. Venezuela no longer wants to be exclusively dependent on oil exports and wants to produce its own food. However, the procurement of seeds is in the hands of foreign monopolists, and the government has difficulties in obtaining seeds at decent prices. To what extent do sanctions have an impact on the supply situation? Direct and indirect sanctions have hit the economic situation in Venezuela seriously. The economic, financial and trade war against Venezuela reminds of the US measures against the democratically elected government of Salvador Allende in Chile in 1970-73 and against the Sandinista government of Daniel Ortega in Nicaragua in the 1980s. Deliveries from abroad are traded in dollars. However authorized persons must sign for the payment in dollars. Many of the persons who have this right to sign are on the sanctions list. This means that no trading partner dares to accept their signature. Thus, the company cannot earn any money because no payment can be made, and the goods do not come to Venezuela. The suppliers are afraid that they will be penalized by US authorities – with fines of tens of thousands of dollars if they fail to comply with the unilateral sanctions regime of the United States. For which goods or sectors do the sanctions apply? That is the next problem. Nobody really knows how far they reach. They are based on so-called catch-all clauses, which can be interpreted one way or the other. But who wants to have to pay a fine? So many international companies are prudent and do not take unnecessary risks. For Venezuela this is devastating. What would help the country? The sanctions must be terminated. The economic war has to end, that would be the greatest help for the country. However, what we can observe in Venezuela is the result of a targeted economic war. There are many countries participating, even from Europe. The misinformation about Venezuela has been successful – even with people who should be better informed. You have to be on the spot to see that the situation is not like you read in The New York Times. If you look at the mainstream media, you get the impression that the country is close to collapse. In fact, the country is rich and with a bit of cooperation and solidarity it could sell its oil, its gold, its bauxite well. Venezuela must now trade a lot with China and India because of the very limited trade with the US and Europe. Is the oil trade also subject to the sanctions? During your stay you could certainly talk to the population. What impression have you gained here? Many are somewhat resigned because they suffer from an economic war. But when it comes to elections, Maduro wins. The majority of the population does not make the government responsible for all that, but they accuse the United States, Europe, Colombia, etc. When the Constituent Assembly was elected, there had been very violent demonstrations prior to the election for four months. In the foreign media we read about those “peaceful demonstrations.” In fact, these were orgies of violence with Molotov cocktails and explosives. It was almost terrorism that hit many normal, non-political people when, for example, a supplier wanted to get from A to B, but the “guarimbas” (violent demonstrations with barricades) blocked his path. Several ordinary people were killed, who only wanted to go about their business. In addition, demonstrators attacked hospitals, nursery schools, burned ambulances and buses in order to intimidate the people. Is this not just classic terrorism? Did the demonstrations succeed with these methods? No, 8.5 millions of people went to the polls for the Constituent Assembly, in spite of the guarimbas and in spite of the violence. In the local elections of 15 December more than 9 million went to the polls. The opposition does not succeed in changing the people’s mind, but the polarization of the country continues to be a problem, because Chavistas are very strongly pro-government, and the MUD is very strongly against the government. There is very little sense that “la patria es de todos” (the fatherland belongs to all). According to media reports in the US and Europe, the only solution is regime change, to chase the government from office. We must however not forget that this government was democratically elected in 1999, in 2002 it survived a coup because the people and the army opposed the coup and prevented the planned physical elimination of Chávez. In 2004 a recall referendum was held, which Chávez won easily — 70% of the population did not want to remove him from office. After his death in 2013, Maduro was elected President, in spite of a violent campaign, accompanied by terror and sabotage on the part of the opposition. How did the government deal with all these organized attacks? The government relied on the 1999 Constitution. However, a number of major mistakes including excessive force by the police, did occur. If a government is under such pressure, then it must act quickly. If one acts fast, one makes mistakes, often goes too far. This includes, for example, introducing economic measures that can be counter-productive, including subsidies and price controls. What kind of agenda does the opposition follow? They wish to cancel the Chávez and Maduro years and return to a purely capitalistic model. But there are at least 8 million Chávistas, and they will not disappear. These voters are convinced of the government’s program. These people will not allow the social achievements to be swept away. If the economy does not collapse as a result of sabotage, smuggling and sanctions, the government is likely to be reelected in 2018. The administration and the army are on the side of the government. Certainly, the plan in Washington is to launch a military attack on Venezuela by making use of disinformation about the allegedly miserable situation in the country with hunger, infant mortality and an economically desolate conditions, and then to chase the government out of office. We know this proceeding from other countries, so for example from September 1973 when the government of Salvador Allende was overthrown by a coup and Allende died. How do you assess your stay? I got a very different impression from the one I pictured to myself before I visited the country. In our media there is scarce interest in truly investigative journalism, in discovering what the root causes of Venezuela’s problems are. We get a caricature of the situation, and this caricature becomes dogma. Weeks before my journey, my independence, my professionalism, my honour were questioned. UN Watch published an article and called my visit a “fake investigation”, even before I had set foot on Venezuelan soil. Some NGOs have claimed that I was not the right Special Rapporteur for these questions. That was before I had announced anything at all about my journey. On my personal blog I showed pictures of Caracas, its churches, monuments, and a picture of a supermarket that was full of goods. After that there were particularly offensive attacks against me. UN-Watch found the picture and reacted to it. I had published the picture without any comment. I was attacked as a chavist, a castrist, a communist, etc. All I wanted to show is that the situation is not as they want us to believe. I had seen so many pictures of empty shelves that I thought it was legitimate to show a different photo in my private blog (which also reflected my observation in other supermarkets). What did you suggest to the Venezuelan government? I submitted to the foreign minister six pages of preliminary recommendations, among others institutional improvements, the elimination of price controls, the fight against smuggling and corruption, but always within the rule of law. They ought to respect the UN covenants on civil, political, economic, social and cultural rights. They are already seeking dialogue with the opposition and showing commendable flexibility and patience. They should either release individuals who have been imprisoned for political reasons, or take them to court with a fair trial. And for the better management of the country they need technocrats, not only ideologists! Above all, the government must prove that it takes human rights seriously. Corruption must be fought at all levels, even with the help of the UN Office on Drugs and Crime in Vienna. In doing so, UN organizations, such as the World Health Organization, the FAO (Food and Agriculture Organization), the International Labor Organization (ILO), etc. could help to ensure that the necessary improvements are translated into action. What do you think of the conversations you had in the Dominican Republic? Every opportunity of dialogue with the opposition must be taken. The previous meetings in Santo Domingo in November, December 2017 and January 2018 have already been fruitful. Further meetings are planned. It is in the interest of all who care for human rights and who care for the Venezuelan people to support these negotiations. Unfortunately, a “human rights industry” has emerged that has instrumentalizes human rights as weapons of mass destruction against governments. This “industry” is not interested in solving the “humanitarian crisis”, they want to use the hyperbolic “crisis” as a pretext for military intervention and regime change. This “industry” does not want independent experts who travel to Venezuela to find out what the real situation is. They only want “experts” who go to Venezuela (or elsewhere) simply to grandstand and condemn governments. If anyone means it with humanitarian aid, they should offer their cooperation to the government and send food and medicines without strings attached. If they are interested in the Venezuelan people, they will make sure that sanctions and boycotts are lifted, so that the Venezuelan government can function normally, without discrimination, in the international community, so that Venezuela can import and export free of sabotage and political ostracism. The Alliance for Global Justice, and anti-imperialist solidarity group based in the US, will be holding a live webinar with Alfred de Zayas this Sunday, January 28. Follow this link for information on how to register.